Posted August 23, 2017 by Josette Farrell in News. By Siobhán Holliman, The Tuam Herald. 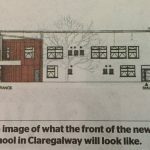 PLANS for Claregalway’s first purpose-built building for the area’s Educate Together school are facing substantial opposition from some parts of the local community. 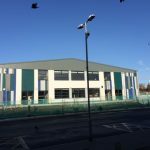 The new two-storey primary school is part of a joint application by the Department of Education which is also seeking to further expand Coláiste Bhaile Chláir. An objection has been lodged with Galway County Council planners by the Claregalway Community Development Association who say both schools are “wonderful” and deserve high quality facilities. But the association argues that the plot earmarked for the Educate Together school goes against planning policy as it’s zoned residential. Their detailed submission also raises what it says are longstanding community plans to develop amenities for use by all community stakeholders on the land which is close to the Claregalway Community Centre. It believes that putting a school on the lands will also make it impossible for either school to expand in the future and doesn’t provide space for playing fields for the schools. The submissions by the development association and a number of other objections mention repeated requests over the past two years for a meeting between the Department of Education and local residents. Objections by a number of local residents argue that traffic is already very busy in the area and this development will create further congestion and endanger public safety. 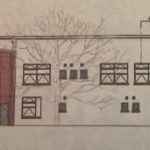 Shortly after the application was lodged last month, letters supporting the planning application were submitted by a number of groups, including the Educate Together school’s parents’ association which points out that the temporary premises is no longer fit for purpose. 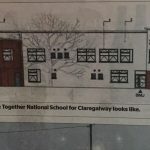 It’s understood that a plot of land that was for sale previously behind the existing Claregalway Primary School was suggested to the Department as a possible location for the new Educate Together school building but nothing came of the idea. Submissions from residents claim efforts to engage with the Department and planners have been ignored. The Department of Education has declined requests for a meeting with the community and correspondence stressed that the Educate Together School and the expansion of Coláiste Bhaile Chláir would be located on lands already acquired by the Department. It wrote to the association in January to say that a meeting wasn’t feasible. The development association in their submission warned the Department that if the planned proposal went ahead the location of the new school would become a “protracted and divisive issue” and could involve “many forms of protest”. The applicants say work on a wider access road linking the school site with the N18 via Lakeview Road has been completed. However, residents argue that drop-offs to the school are still being made by people using narrow “rat run” roads where it’s difficult for cars to pass.